Today’s article focuses on an effective and versatile cosmetic dental procedure—porcelain veneers. Veneers are individual covers for the front part of teeth. They are a terrific way to fix a myriad of tooth imperfections such as chips, stains, yellowing, unattractive shape or minimal misalignment. Have you ever hoped for a minimally-invasive facelift for a tooth without getting an entire crown? Veneers are your answer! Super-strong, tooth-colored porcelain laminate is shaped into thin shells and custom-fitted for each patient’s unique set of teeth. How many veneers should you get? This depends on how many teeth you want to beautify and the overall condition of your teeth. 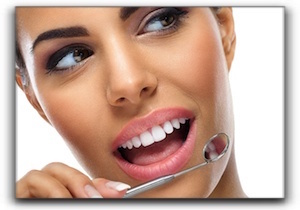 Cosmetic dentist Dr. Mirelez will counsel you on the most beneficial strategy. The thickness, color, alignment, and shape of your teeth influence the result as well as whether you have any gum recession. Veneers are matched to your existing teeth so they will blend seamlessly, but if you are planning to treat several teeth, you definitely want to have them constructed in the same “batch” at the lab. The first step in the veneer process is to make a model of your teeth to work from. After that, a dental technician will use the model to manufacture the veneers to the precise size, shape, color, and level of translucency. Experienced cosmetic dentists and dental technicians elevate the level of artistry in this precise work. Many patients wonder if veneers are as durable as their natural teeth. Though the veneer tooth-prep process weakens the tooth to a very tiny degree, with proper care, veneers can last up to 15 years. Dr. Mirelez will advise you in detail on proper care of porcelain veneers. Porcelain veneers are more durable than dental bonding, which is sometimes used to correct the same types of imperfections. Dental bonding generally has a shorter life span than veneers, so keep this in mind when comparing the relative prices of the two procedures. If you are looking for a dentist with an artistic eye for stunning porcelain veneers, give Mirelez Wellness Dental a call. My name is Dr. Art Mirelez and I have been serving Fresno, CA – California since 2003.